i got a goat for christmas! not just any old ordinary goat but an exotic goat. i know him to be exotic for he lives in foreign climes. it warms my heart to think of my goat living out there in the big wide world with nice folks in their bit of yard, helping them daily with things goats are good at helping with. my goat is named PIP'S FRIEND and one day when i have another goat in my own back yard she will be called PIP and i will be able to say "do not be lonely PIP, for you have a friend living in foreign climes and perhaps you may care to skype with your friend so you feel a little better". i told my man, this was a grand gift indeed. how thoughtful that he should know how much i wished for a goat of my own and yet at this moment in time am unable to give my goat a home in our yard. however now, he has told me i am able to say i have a goat, he just happens to live elsewhere a bit like some of my clan. this kind gesture has greatly made up for the 'panini maker' incident of 2008, i think he felt rather relieved upon knowing this fact. whilst we are on the subject of Paninis i do have some thrilling news to share, 'the thrifty crafty tales of Bernina & Panini' sort of thrilling news which has me most giddy. based upon the friendships of old. the lovely handwritten postcards sent between two friends telling little tales of this and that. 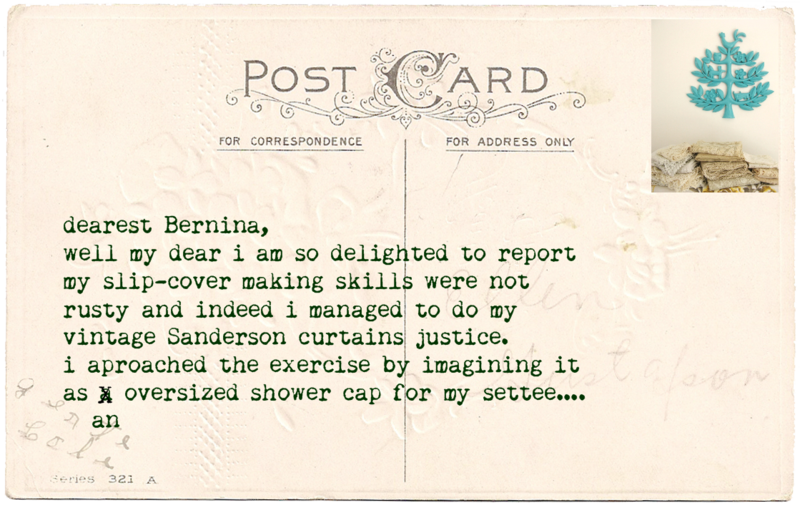 and so it came to be, my lovely friend Bernina (who was gifted a bernina sewing machine for her 40th) and me, Panini (who was gifted a panini maker for her 40th) decided to share our thrifty crafty tales in the way of postcards sent across the pond. we hope you will enjoy reading the rambling postcards sent between two eclectic women of a certain age, separated by a pond but brought together in the spirit of friendship & by the love of all things granny. Teresa from down under in Oregon. I got honeybees for Christmas! They, too, live in a foreign clime. congratulations on pip. what a wonderful snappy brown head and fluffy bod. Really quite a dapper friend indeed. Seems content with the patterns around him too. oh what joy to have a goat around. maybe, he will need a scarf? Wow a goat of your very own! I had a holiday romance this year with a goat called Ken. 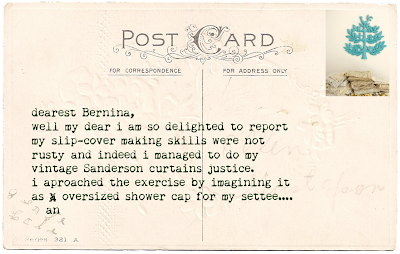 I really appreciate your idea of sending postcards between you, panini, and your friend, bernina... and those names, of course! It reminds me a little bit on my sister (Canada) and me (Germany). Its a wonderful new blog! A lovely gift! sometimes it is better to have a goat that lives in someonelses backyard. Mine now lives two yards down, lol. Soooo muchly enjoy your blog and the grand idea of "granny chic". I will be a granny any day now! your book should arrive at my doorstep soon. Thanks for being you and an encoragement to creative folk out here in blog land! love your goat....believe me, it's the best kind to have. i bought a purse...a very funky and fun purse on line from ted and alice...is your friend part of this clan? if so, she and her trusty machine to excellent work and i have received many many compliments on my fun bag which i think is called edith and i bought as my most favorite granny in the world was named edith but i called mimi which is far tmi but was fun to think about. Goatie is lovely and I think you will be great friends! Just popped over to the new postcard blog and read every one...what a great venture and I look forward to more. Thank you! I heard it is snowing madly up there, so I hope you are having fun with it all!! Your goat has a fabulous little beard, by the way. A little plastic goat is way more thoughtful than a panning maker. I dislike being pedantic, but I feel compelled to say "having been bRought up in different countries.."
It is something I cannot help but share, I hope you don't mind. thank you for the postcard blog visiting, and hope you will enjoy visiting again if you are so inclined. how lovely to be gifted bees, now that is a brilliant gift to give to one who wishes to have bees but cannot. Our #1 wishes for such a thing and was turned away from the bee keeping society in her local city due to lack of bees i believe. now perhaps i could remedy this! I just came across your lovely and entertaining blog. I also was gifted a goat at Christmas by my children. It also is living in a far-off country where it is needed. I have only begun to look at some of your creative endeavors (it is getting late here in Oregon) but I wanted to ask you specifically how you feel about Pinterest. I mean, would you like to have some of your creations "pinned" (with due credit, of course)? Those kind of goats are the best!!! !I happen to know being a major things of all Playmobil. He looks extremely at home but if you need any grass/trees/hedgerows please feel free to get in touch!!! Love the goat. Many moons ago my neighbour had a miniature goat. She was a beauty and was named Gabrielle. She used to totter through our house (in warmer climes)looking most elegant. The postcards are wonderful. Brilliant idea. If you so desire you can be an adoptive auntie to my two goats Eric and Ernie. I am sure they would like to think of an auntie from across the pond thinking of them too! I'm glad that your wish for a goat has been granted. Indeed, you are a very thoughtful owner to allow your goats (I say goats because I just know that Pip will come soon) to be friends. It is a very handsome goat indeed. I got me a dishwasher for my 40th last year. Good thing we're not postcard pals. Panini and Whirlpool isn't as snappy. I've been reading your blog for a while and just wanted to let you know how inspirational it is. Also bought a copy of your lovely book. Your new goat is super cute! And the name Pip is my son's nickname for himself! Haha! Love the postcard exchange. Very Griffin & Sabine. good question Kathy, no i do not have a pinterest account, i actually spend very little time online looking at images therefore i did not see it as something i needed to add to my long list of 'cyber doings'. however i do know many of my images are pinned and i am most happy for folks to do so as they appear to always link to me. i am sure some go astray but unfortunately, rightly or wrongly, there is not a lot one can do about it. Georgina! oh how i love the sound of Eric and Ernie, i think the thought of adopting them is rather a lovely one.